Dr. Nikolaos Bakas is a civil engineer, lecturer at the School of Architecture, Engineering and Geo-Environmental Sciences at Neapolis University Pafos. His studies comprise the Diploma of Civil Engineer NTUA (2003), the postgraduate Diploma Structural Analysis and Design of Structures (2005) and the PhD degree in Engineering of NTUA (2011). He has adjacently taught at the NTUA, and at Neapolis University from 2012 to the present. 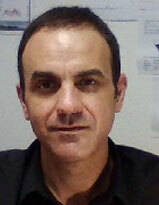 He has participated in a variety of research projects, at the National Technical University of Athens, in engineering software companies in Greece and at the Neapolis University, on applications of computational mechanics, finite elements, artificial neural networks, optimization algorithms, design regulations and development of computer codes. Furthermore, in research and development of professional engineering software and in the organization of scientific and technological seminars.